Now, it’s time to talk about teaching Social Studies to ELLs. As an educational consultant with Seidlitz Education and the author of “Teaching Social Studies to ELLs,” Tina Beene leads professional development sessions targeted toward improving outcomes for English learners. She previously served as a bilingual teacher, elementary instructional specialist, secondary EL coach, and bilingual program coordinator. She’s a passionate advocate for English learners, social studies content, and the power of utilizing the perspectives of the former to engage all students in the latter. 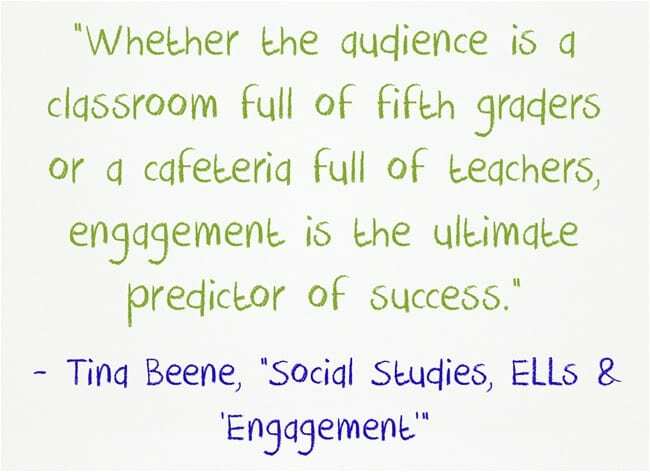 Student engagement will never exceed teacher engagement. The same could be said for effort. Not once in my teaching career did a dry lecture leave my students clamoring for more and even the most dramatic moments of our Trail of Tears simulation were no match for PE, recess, or lunch. They often cared as much as I did, certainly, but never more. Engagement IS NOT method-dependent. A truly rousing lecture a la Dead Poets Society can certainly be memorable and a highly interactive scavenger hunt can absolutely be disastrous. The amount of prior planning and the passion brought to the task together have a much greater influence on student engagement than the method of instructional delivery itself. As with most things, variety is key and all learning strategies are best employed in moderation. Engagement IS comprehension-dependent. Learners can’t engage with content that’s incomprehensible. To increase comprehension, teachers have a choice: either make the content more accessible or raise students’ language proficiency. The best teachers do both, explaining key points using simple language, gestures, visuals, and other language acquisition methods while also building both academic and general vocabulary. I’ve found that one of the best ways to make content accessible is to make it relevant. Students and teachers both need to see how the information relates to their own lives. What is history, really, beyond the recounting of individual circumstances that add up to collective experiences? Every student has a unique story that has been shaped by forces beyond their own choices. Helping them to connect their own life path with the events that occurred and the people who lived before them provides meaningful context for learning while strengthening their sense of self, which in turn leads to greater confidence and self-esteem—two attributes sorely needed during adolescence. Additionally, drawing on my students’ personal connections to the content even when the events in question preceded their birth by several centuries had a profound impact on the classroom environment. Occasionally it was rough for everyone to navigate the cultural divisions but by looking at the diversity of perspectives as a gift instead of a hardship, we freed ourselves up to celebrate our differences instead of trying to minimize them. And what differences there were! I was raised in a very small town in central Texas. My rural upbringing was in stark contrast to the urban poverty in which my students were living out their formative years. Most of my kids had never been to a rodeo and I’d never attended a quinceañera. They didn’t understand what I meant by describing their writing edits as “putting lipstick on a pig” and, as a learner of exclusively academic Spanish, I didn’t know how to distinguish between actually profanity and when the offending term was just verboten to the tattler who was reporting the grievance. By viewing what I didn’t know as an opportunity rather than a deficit, however, I gave them explicit permission to do the same. That led to a classroom environment where risk and mistakes were encouraged, which subsequently accelerated their content mastery and language acquisition. Beyond its academic implications, however, lies the true value of social studies instruction. Through analysis of the past, students realize they are a part of something bigger than themselves. By connecting those events to their individual lives, we help give voice and context to their personal truths. In the end, students feel valued, connected, and seen—and if that’s not a recipe for engagement, I don’t know what is.